The days are getting shorter (barely light by 7:00 a.m. and dark not long after 6:00 p.m.), and a chill is permeating the air; this only means one thing: autumn is here! Though we haven’t had to deal with snow yet—knock on wood—winter is quickly rounding the corner to descend on Black Hills area residents. And when winter hits, it does so with a vengeance. It grips the region and doesn’t let go. It holds on, absolutely for dear life, for months…and months…and months. These early autumn days, as I have been writing about much lately, are absolutely beautiful. The temperatures are superb. The colors are delightful. And seasonal food from this time of year is delicious. I don’t hunt; I hike…and cook. So these cooler days when my hunting husband and son work to fill my freezer, I look for ways to use the game meat. The falling temps mean I can take my time in the kitchen, letting the oven warm my house and heart, to slowly make a great meal. 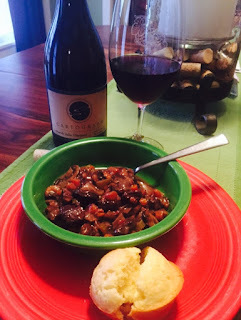 I channeled my rural, inner Julia Child and modified a recipe found in a Cabela’s catalogue. Yes, the same place you can buy camouflage clothes for hunting has some great recipes, especially when I add my add twist. Here is my Venison Bourguignon. 2. On the stove top, heat enough olive oil to cover the bottom of a cast iron Dutch oven; I used La Creuset cookware. Heat to medium. 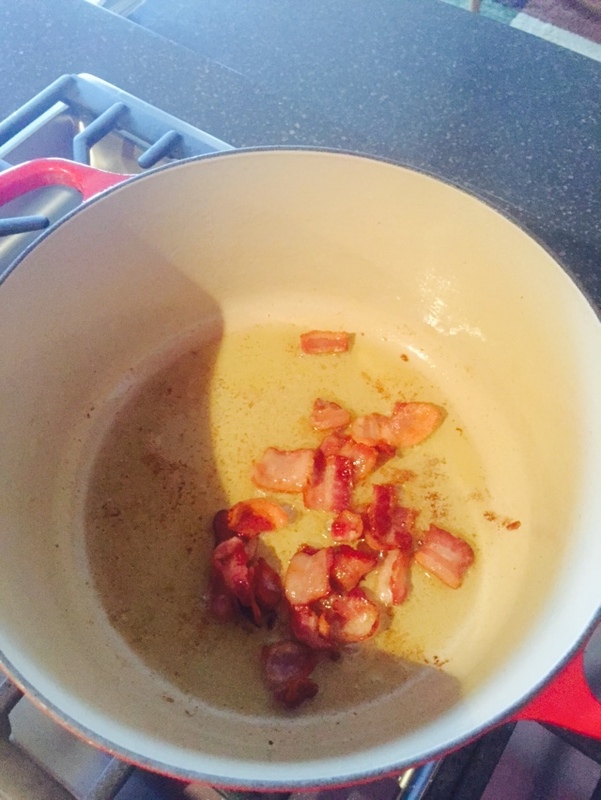 Add bacon and sauté until bacon begins to brown. Remove and set aside. 3. Dry the cubed venison on paper towels. 4. Brown the meat in small batches in the olive oil/bacon drippings. Remove and set aside with bacon. 5. 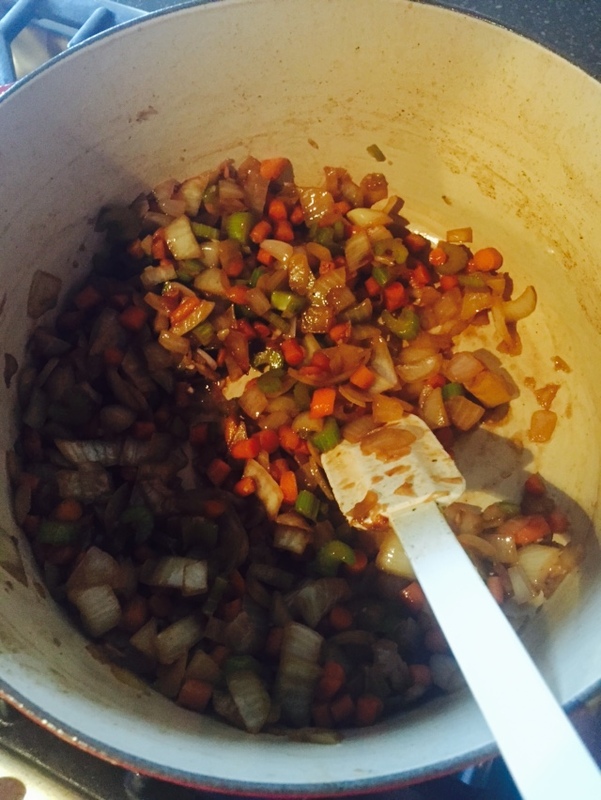 Cook chopped onion, celery, and carrots in the drippings until soft, about ten minutes. Will not caramelize. Add the garlic. Sauté another few minutes. 6. Add the port. With a spatula, rub the bottom of the pan so drippings blend into the port and veggies. Stir well to coat all the veggies. 7. Flambé port in pan by tipping up to pool port in the corner of the pan. Light to burn off the alcohol. 8. Lightly dust venison with flour. Return meat to the vegetable mixture in the Dutch oven. Also return bacon. 9. Add salt and pepper. The sauce will reduce, so go lighter on the salt. 11. Turn the oven down to 300 degrees. Cover the stew. Simmer in the oven for two to three hours. 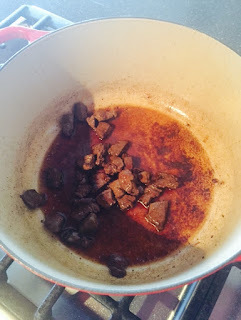 The wine/port sauce should be reduced and thickened. 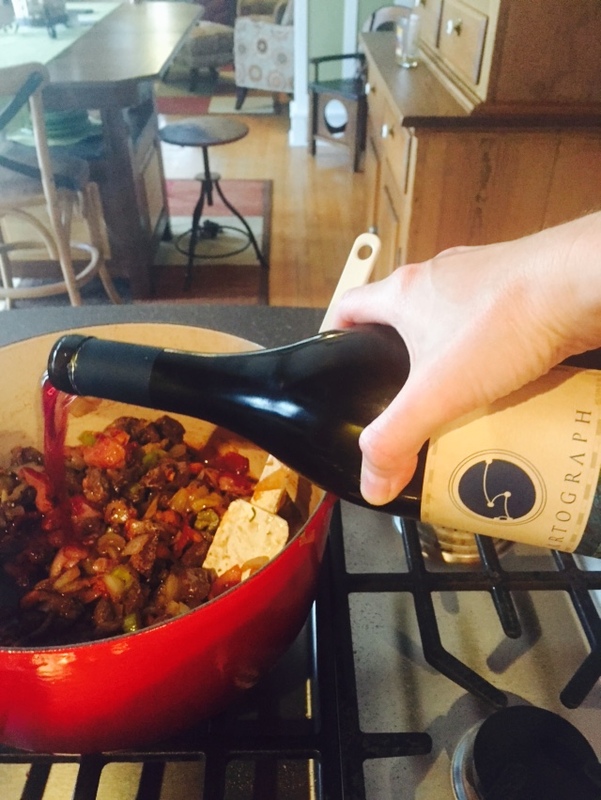 If too much sauce reduced, add more wine, beef stock, or water at any point, remembering water may dilute the flavor more than wine or stock. 12. After the two to three hours, melt 2 tablespoons of butter in a pan on the stove top. Sauté the mushrooms until begin to caramelize. Add to the stew. 13. Melt the last 2 tablespoons of butter. Add up to 2 teaspoons of cornstarch; stir into a paste. If reduction sauce is very thick, use less cornstarch. Add paste into stew. 14. Cook in oven ten more minutes. 15. Serve! Can serve with corn bread (which is what I did because I loved the oven going all day) or use the stove top to make a creamy polenta. Could also boil or mash potatoes for side dish, as well. 16. Pour a glass of the wine used in the recipe for a natural marriage pairing…and enjoy! Fall may mean cooler temperatures and beautiful scenery, but in my household, and for many where I live, it means hunting! Using game meat is a special treat that can be enjoyed on days when much time and joy can be given to the cooking process. Put on that wool sweater and turn on the oven. Connect with your inner chef using autumn’s recipes, which are great well into winter. Enjoy the comfort food all season long.